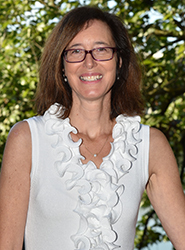 Renée D’Elia-Zunino received her education in Genova, Italy, with an M.A. and B.A. in Italian and English Comparative Literature, Università degli Studi di Genova, Italy, 1997. She joined the University of Tennessee in 1998. She is a Distinguished Lecturer and her courses range from Beginners Italian, to Intermediate, to Cultural upper division. In 2014 she launched an online learning module called Impara l’italiano con l’ispettor Zunicchi, that she implemented in her 341 and 405 classes on Il Giallo – the History of the Italian Mystery Novel. She recently offered a course on Made in Italy, that involved researching what is behind the label and its products, the economic impacts for Italy and the world, and had students interact with Italian companies via Skype interviews. She has received numerous awards and grants, and is the advisor for the Italian Club at UT. She recently published a children’s book: The Curious Adventures of Wickl-Wackl and His Friends, Xlibris Dec.2017. The Myth of Whiteness and a Changing Italy: Historic Memory and Colonialist Attitudes in Lamerica, in At Home and Abroad: Historicizing Twentieth-Century Whiteness in Literature andPerformance- The University of TennesseePress, Knoxville 2009. “Passing” for Black or “Passing” for White. Authenticating Middle-Class American Whiteness Through Blackness, in Reconstructing Societies in the Aftermathof War- Bordighera Inc. 2004.